The Austrian outlasted the Serb in a clay court classic. It was the blockbuster matchup of the day that everyone was looking forward to. 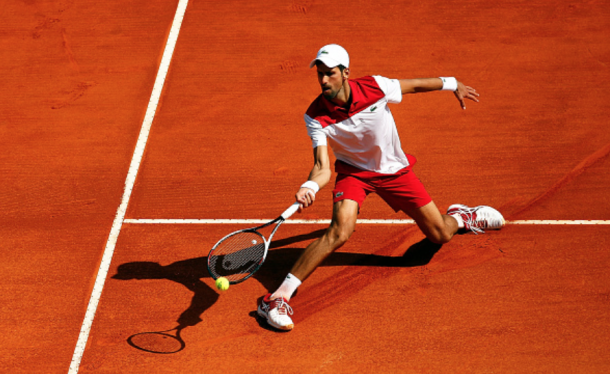 Novak Djokovic, a former Monte Carlo and French Open champion was taking on Dominic Thiem, one of the best clay court players of the younger generation. Their last meeting saw the Austrian win in straight sets at the French Open, and it was another three-set affair in the principality as he edged the Serb 6-7(2), 6-2, 6-3. The opening game saw the Austrian hold at love, and he quickly found himself with a break chance in Djokovic's opening service game. The pair were exchanging forehands and backhands before an aggressive forehand saw the 24-year-old in control of the point. He capped off the break with a forehand winner down the line. Djokovic finally got on the board in the fourth game after holding his serve. It was cruise control for Thiem the rest of the way, and he looked to strike up 5-2 for a break and an opportunity to take the set. A trademark Djokovic backhand got him into the game before Thiem found himself with set point. Djokovic's arsenal was on full display, saving the set point by getting Thiem to the net on a drop shot and followed that up with a lob before capping off the point with a stab volley at the net. Not many could go toe-to-toe with the former world number one on the backhand side, but Thiem did just that at 5-3, 30-15 up before firing a backhand winner down the line for set point. Despite the chances to take the set, Djokovic would break back after a missed overhead from the baseline from Thiem. The former Monte Carlo champion leveled the set. The set went into a tiebreak, and Thiem who was well in control of the opening set, was down 1-4 after a missed squash forehand into the net. Djokovic stole the opening set 7-6(2) after a double-fault from the Austrian. At two-all in the second, the Austrian began to make his move once again. An overhead set him up for 15-30 and then a massive forehand down the line forced an on the stretch Djokovic to dump his attempt into the net. Despite missing his first two chances, Thiem was gifted the break on his advantage after an errant backhand from the Serb for a 3-2 lead in the second. Thiem's third service game of the set saw him endure a grueling battle just to hold serve. He saved break point chances and came up with his best tennis when it mattered, hitting a forehand winner for advantage and consolidating his break with an ace out wide. The Austrian would capture a second break of serve after Djokovic's backhand found the net and would take the set in the same way he earned his second break. After grinding out for the second set, the 24-year-old was made to battle to hold his first service game of the third set but got the job done. He worked hard again for his second service hold, finishing it with an overhead. Thiem would get the break at three-all. Djokovic led throughout the game, but the Austrian brought it back to deuce. 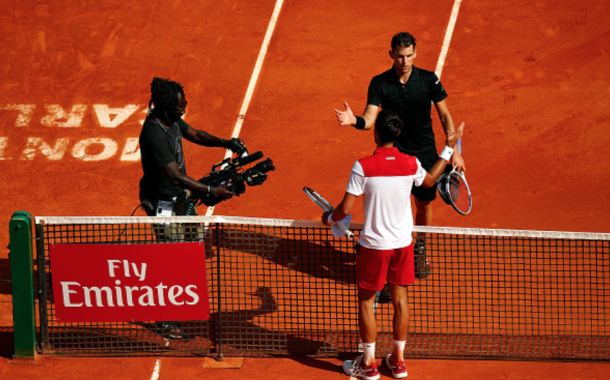 Thiem fired a massive backhand down the line that the former world number one could not get over to take the break. With Djokovic, serving to stay in the match down advantage, he perfectly set up a Thiem short ball after a well-angled cross-court backhand but his backhand down the line went well long to seal the match for Thiem.